I used to look at damselflies and think they were one and the same. It's pretty much how any vaguely similar-looking creatures appear before you learn the terminology and take the time to unfold the mystery. Approximately five years ago I finally decided to try to crack the code on damselflies and the task turned out to be not overly cumbersome. If you're dealing with the damselflies of British Columbia, Rob Cannings' "Introducting the Dragonflies of British Columbia and the Yukon" lays out the diagnostics nicely and aided greatly in all my early identification endeavors. Any travels further afield, Dennis Paulson's fantastic "Dragonflies and Damselflies of the West" and its geographical sequel "Dragonflies and Damselflies of the East" are great purchases and will help unfold most North American identification conundrums you encounter. In the spirit of breaking down the walls of identification, I took some shots of local damselflies today and will point out some key features to distinguish them from species similar in appearance. If you think they are too daunting to bother looking at in detail, perhaps this can change your mind. 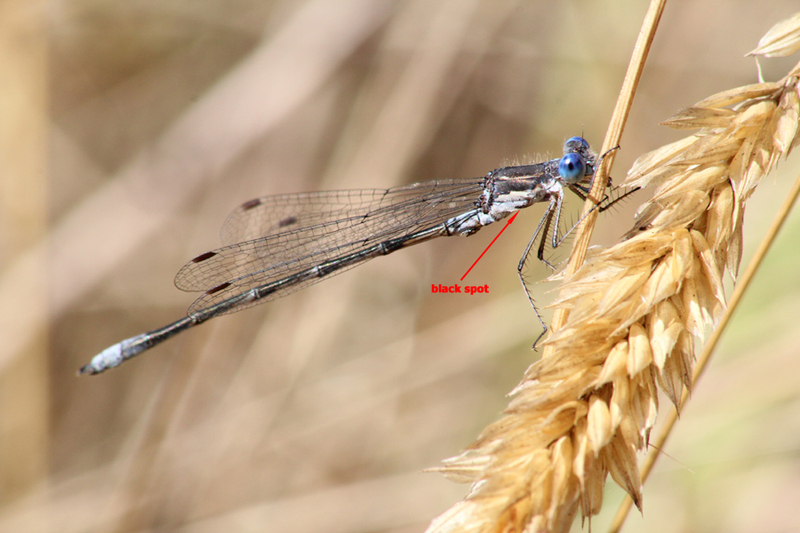 Before getting into the nitty gritty, I will do a crash course on damselfly anatomy with a labeled photo - click the photo to see it slightly larger for best results. 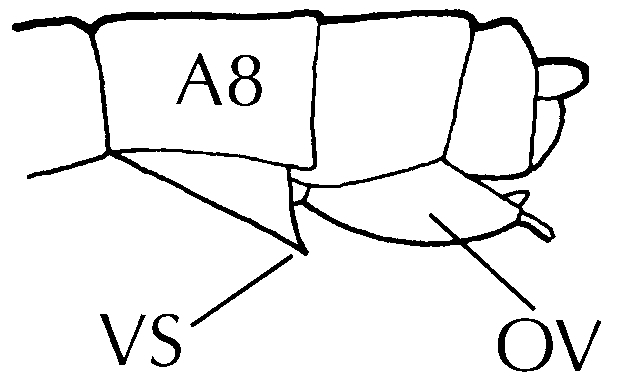 The features that are pertinent to this exercise are the terminal appendages (cerci above and paraprocts below), ten abdominal segments, and antehumeral stripes on the thorax. I will start obvious by looking at the forktails. Forktails in British Columbia are easily distinguished from bluets by their mostly black abdomen with two or three blue subterminal abdominal segments. We have four species in the province of which three are found on southern Vancouver Island. In my last post, I took a shot of a Western Forktail (Ischnura perparva) and mentioned the antehumeral stripes on the thorax separated it from the more abundant Pacific Forktails (I. cervula). I'll resurrect the photo of the Western Forktail here and then follow it up with a shot of a Pacific for comparison. The only species I did not find on this outing that can be found locally (but seemingly scarce on Vancouver Island) was Swift Forktail (I. erratica). 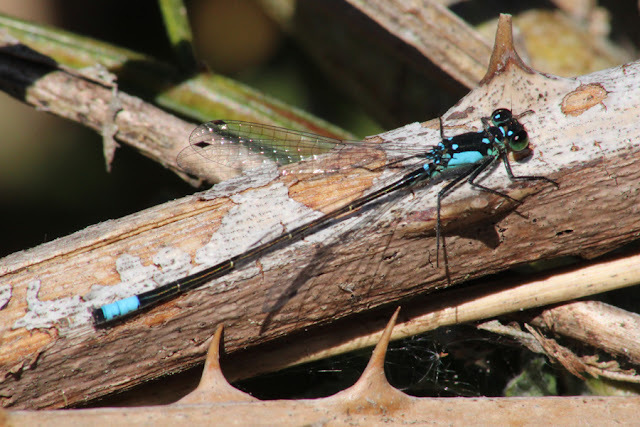 It is a larger forktail that has blue extending up onto its 7th abdominal segment in males, whereas the blue stops at the 8th abdominal segment on both Western and Pacific Forktail males. Click the link here for a photo I took a couple years ago that shows this feature nicely and compare to the more common species below. Abdominal segments S1 to S7 and S10 are black while S8 and S9 are blue, which gives the impression of a black abdomen with a blue tip. Once narrowed down to forktail by the abdominal pattern, this individual can be identified as a male Western Forktail by its small size and two thin, blue antehumeral stripes. Once again the black abdomen with blue tip (S8 and S9, again) appearance pegs this as a forktail, locally. From there, the four blue spots on the thorax distinguish this as a male Pacific Forktail. I can't fully demystify every individual you come across with this overview, unfortunately. 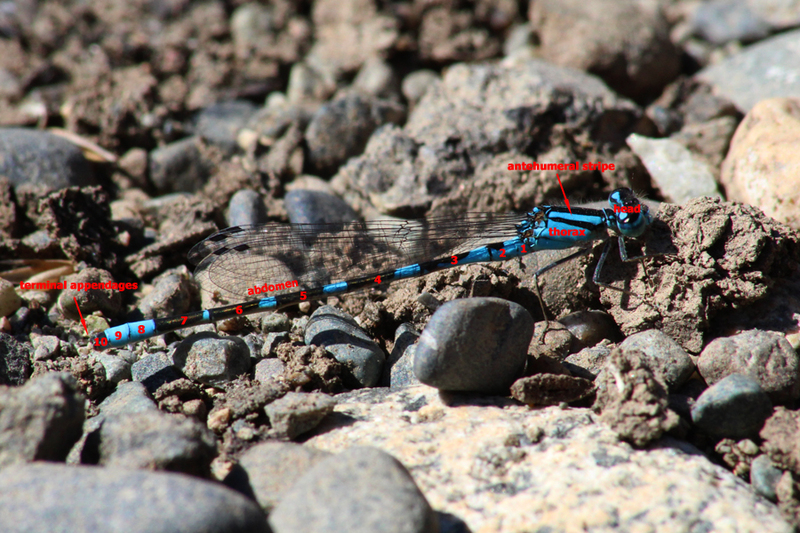 Pacific Forktails that have not gained their mature colouration have markings that resemble antehumeral stripes. Experience is required to gauge size and determine whether the individual you're seeing is showing the pattern of a fully-matured adult. I am approaching this more from the angle of identifying males of each species because they are a nice starting point. If you're ever unsure about the identity of a male forktail, their terminal appendages (scroll down) are a good fallback. I always thought I needed a microscope or hand lens to view the shape of the terminal appendages, but you can simply invert your binoculars and hold them very close to the object of your interest. Females can be very difficult to distinguish, so I typically don't bother. However, if you're motivated you can try to locate the vulvar spine which female Pacific Forktails often have and Westerns lack. The next species I encountered comes from a much more perplexing genus: Enallagma, also known as the American bluets. In British Columbia, six species are common and another is known from a single specimen that may or may not be erroneous. On southern Vancouver Island, I have the opportunity to encounter three species and fortunately one is considerably easier to identify than the other two. I managed to get several shots of Tule Bluets (E. carunculatum) to illustrate what they look like, and then you will hopefully be able to spot a Northern (E. annexum) or Boreal Bluet (E. boreale) by contrast. Male Tule Bluets have a greater proportion of black to blue on their middle abdominal segments. This angle is not the best for illustrating this point, but you can still see that the extent of black is greater than blue. Males Northern/Boreal Bluet complex are noticeably bluer, with only thin black bands on segments 3 to 5; segments 6 and 7 are still largely black on Boreal/Northerns. This is a better example of the proportions of black to blue on a male Tule Bluet's abdomen. Boreal/Northern Bluets have more blue than black on segments 3 to 5, whereas Tule has more black as you can see above. 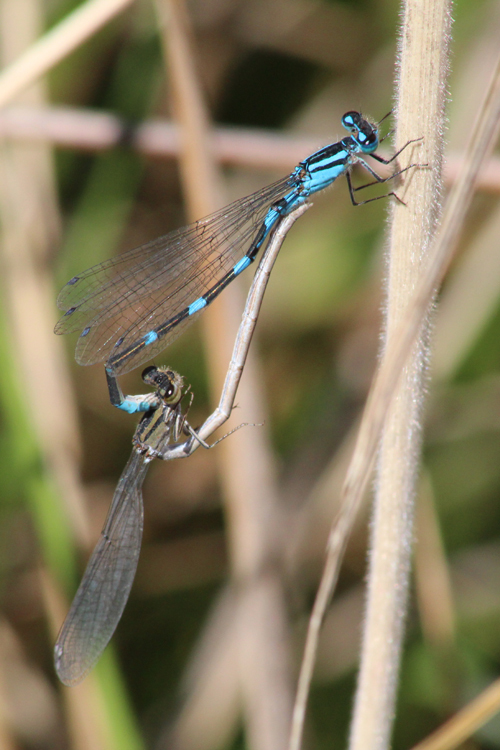 Here is a pair of Tule Bluets in tandem. Female Tule Bluets can apparently be distinguished from the other local bluets by the full black stripe on the 8th abdominal segment, which is highlighted in the above photo. This pair of Tule Bluets is in the wheel position. When the damsels are in this position, they often form a heart - it must be love if she has decided to accept the sperm from his secondary genitalia, as the old saying goes! 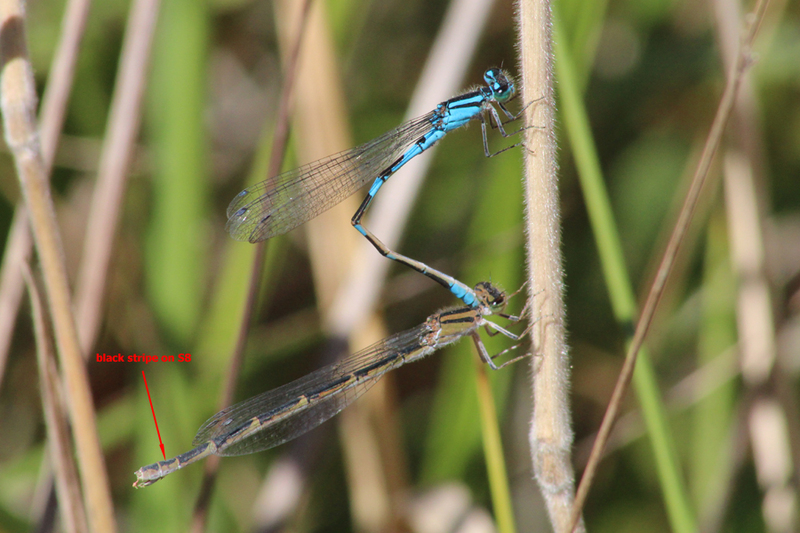 If you want to confirm you've got a Tule Bluet and have a means of catching one, you can once again check the male's terminal appendages (scroll down). If you find a bluet on southern Vancouver Island that has more blue than black on those middle abdominal segments, you'll need to look at the terminal appendages to narrow the identification down to species. The last damselfly I photographed is a spreadwing, which, as its name implies, perches with its wings half open. On southern Vancouver Island, all five species of spreadwing found in the province have been recorded. 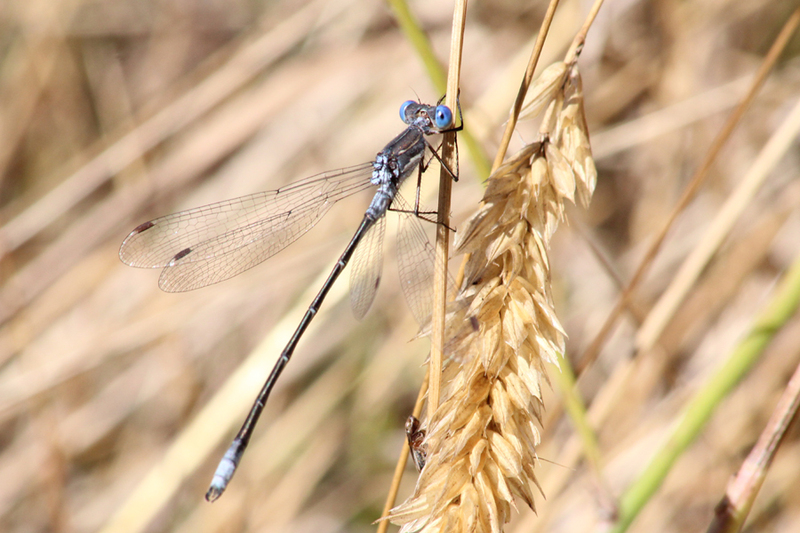 The rarest of the lot is Sweetflag Spreadwing (Lestes forcipatus), which was discovered in British Columbia less than 15 years ago. The male Sweetflag Spreadwing is hard to differentiate from Northern Spreadwing (L. disjunctus), but the female is diagnostic in having an ovipositor (Northern above, Sweetflag below) that extends beyond the end of the abdomen. Sweetflag Spreadwings seem to prefer sedge fens and last time I checked we don't really have any in Victoria proper, so it is pretty safe to call them Northerns in most urban areas. If head back into "the sticks" and navigate around some interesting wooded ponds, bogs, or sedge marshes, it's certainly worth double-checking female spreadwings for Sweetflag. With that disclaimer out of the way, the remaining species can easily be identified by the male's terminal appendages (scroll down). I luckily had a species that does not even require looking down to that level, even though it's quite easy with spreadwings. I found Spotted Spreadwings (Lestes congener) and was able to determine this by its namesake black spots on the underside of the thorax. This shot shows the typical perching posture of a spreadwing. 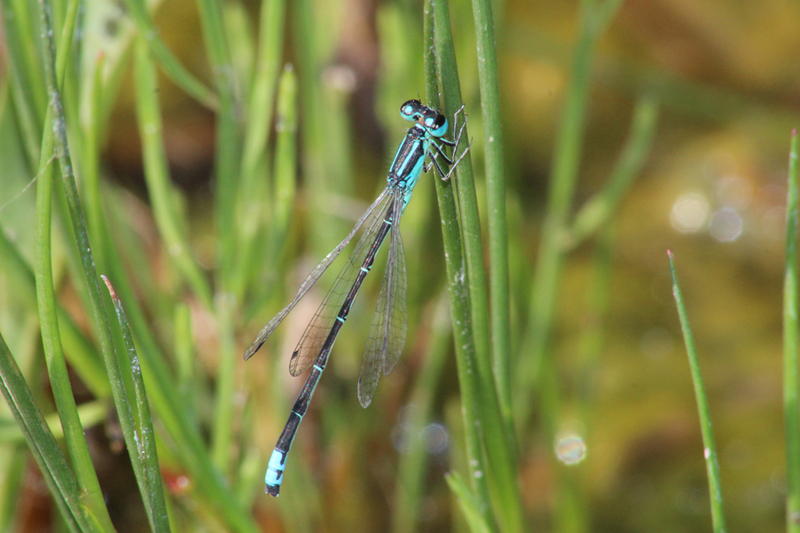 Rather than having the wings folded up like a typical bluet or forktail, they are remain half open. Note that I used the word "typical" - refer back to the shot of the Pacific Forktail above and you'll see that other damselflies occasionally adopt a similar perching posture. Consequently it is not safe to rely on the half-spread wings to determine you've got a spreadwing. This Spotted Spreadwing shows other features that can be used, including: long, skinny abdomen with powder blue terminal segments, thorax that is predominantly dark above and pale blue-grey below, and projecting terminal appendages that have obvious arcing cerci that nearly meet. 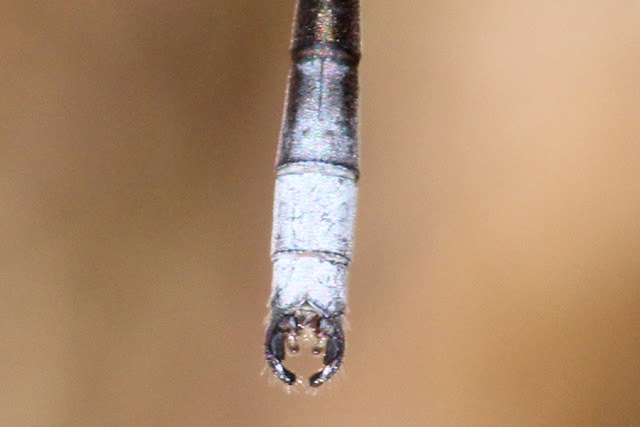 Once you've determined you're looking at a spreadwing, check the underside of the thorax for the characteristic black spots (there are typically three per side) to see if it is a Spotted Spreadwing. In this shot, you can just see one of the dark marks cutting through the pale blue-grey underside of the thorax. 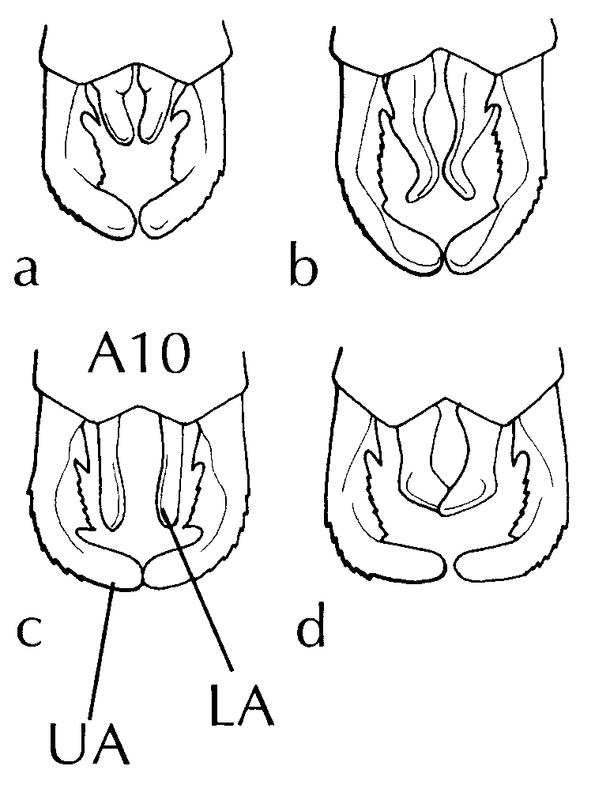 If you refer back to the diagram of male spreadwings' terminal appendages, the top left illustration shows the shape of the cerci (longer, arcing outer projections) and paraprocts (shorter inner projections) of a Spotted Spreadwing. You can see how nicely it matches the cropped photo above. 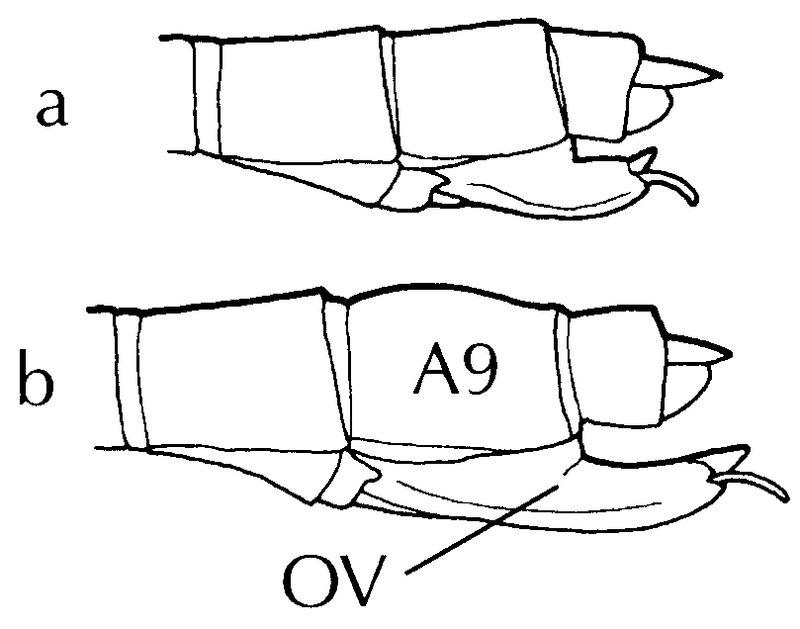 For those who have never attempted to look at the male's terminal appendages with a hand lens or inverted binoculars, you may have been skeptical about being able to see the details shown in illustrations. Let me assure you that it's not overly difficult, especially with spreadwings. In fact, if I catch a spreadwing and bring it up close to my eye, I can identify it without any extra magnification. 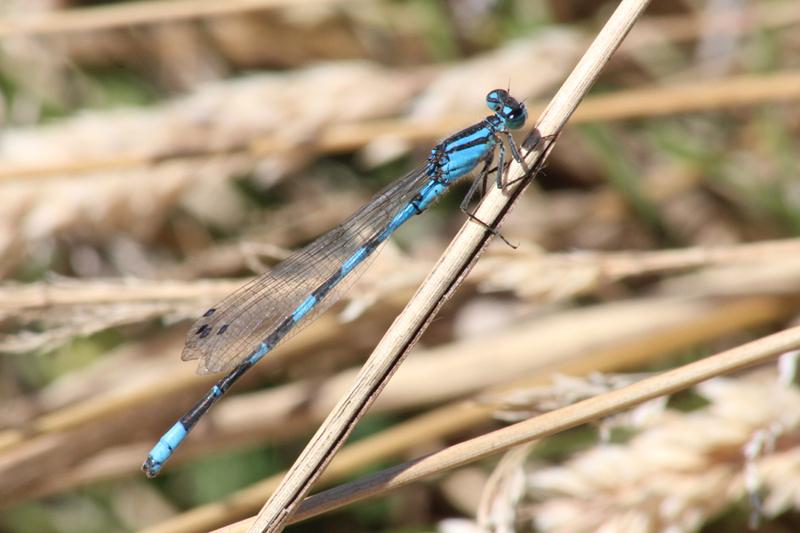 I have covered off examples of the three largest genera of damselflies in British Columbia. The five remaining genera are represented by three or fewer species and only one of these is found on southern Vancouver Island. That latter genus is Amphiagrion, which contains only two species: Western Red Damsel (A. abbreviatum) and Eastern Red Damsel (E. saucium). I don't want to assume you know which one is here, but you should have an inkling that it's Western Red Damsel. I also don't want to assume you would know it if you saw it, so I will tell you it's the only red damselfly around. I have only found Western Red Damsel in one place on southern Vancouver Island, and it was along the railroad tracks above Goldstream Provincial Park. I have also heard it can be found at Rithet's Bog. If you have any questions on where to find any particular species locally or anywhere else in the province, I can certainly do my best to answer your question. You can also hit me up for an identification request and I will try my best to tackle it and give you pointers. Now get out there and enjoy these fascinating little creatures while they're still flying! We're nearing the end of summer and they won't be out for much longer. So, you wanna help me do a Lesser Winged Creatures Big Year? Dear Jeremy. I'd like to identify this one. Photo taken at Scout Island Nature Centre in Williams Lake, mid-July. Don't have a guide book. Could it be a Pacific forktail? Thanks!